Hansen Creek, a small stream in southwest Alaska, is hard to pick out on a map. It's just over a mile long and about 4 inches deep. Crossing from one bank to the other takes about five big steps. Yet this stream is home to one of the most dense sockeye salmon runs in Alaska's Bristol Bay region. Each summer, about 11,000 fish on average return to this stream, furiously beating their way up the shallow creek to spawn and eventually die. For the past 20 years, dozens of University of Washington researchers have walked this creek every day during spawning season, counting live salmon and recording information about the fish that died—for a salmon, death is inevitable here, either after spawning or in the paws of a brown bear. After counting a dead fish, researchers throw it on shore to remove the carcass and not double-count it the next day. The data collection is part of a long-term study looking at how bear predation affects sockeye salmon in this region. 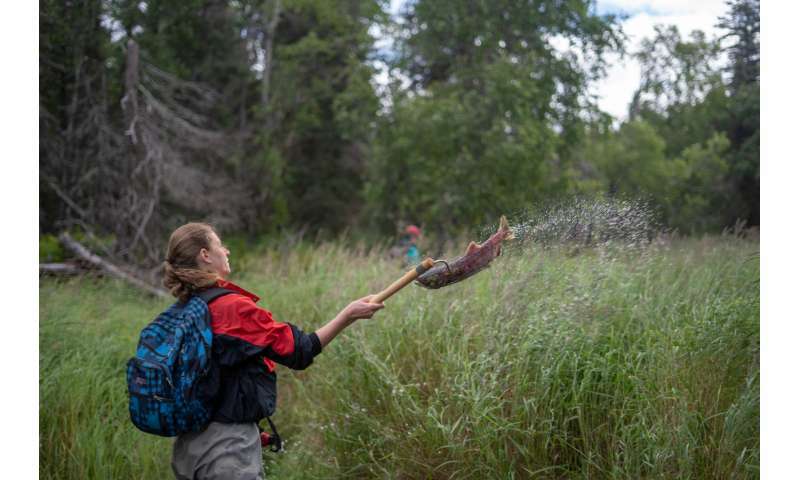 When this effort began in the mid-1990s, Tom Quinn, a professor in the UW School of Aquatic and Fishery Sciences, decided that everyone should throw sockeye carcasses to the left side of the stream—facing downstream. They might as well be consistent, he thought, and who knows—maybe someday they could see whether the tossed carcasses had an effect on that side of the stream. Twenty years later, Quinn and colleagues have found that two decades of carcasses—nearly 600,000 pounds of fish—tossed to the left side of Hansen Creek did have a noticeable effect: White spruce trees on that side of the stream grew faster than their counterparts on the other side. What's more, nitrogen derived from salmon was found in high concentration in the needles of the spruce trees on the side of the tossed carcasses. Essentially, as they report in a paper published October 23 in the journal Ecology, the sockeye carcasses were fertilizing the trees. "Tossing the carcasses to the left side started out just as a convenience to keep from counting the same fish twice. I thought at some point in the future, it would be kind of cool to see it if had an effect," said Quinn, the paper's lead author who has taught and led research projects in the UW's Alaska Salmon Program for 25 years. The researchers were able to tell that the fertilized trees grew faster by taking a deep slice out of the trunks, called a tree core, from white spruce on both sides of the stream. They examined the growth rings during the 20-year study period (1997 to 2016) as well as for the 20-year span before the study began (1977 to 1996), looking at the spacing of the rings each year. The first 20 years served as a control for the field experiment, because during that period the trees on both sides were growing under similar densities of salmon carcasses. By 2016, the trees on the salmon-enriched side were not noticeably taller, the authors found, even though they grew faster over the 20-year study period. This is because those trees started out shorter and were growing more slowly before the study began than their counterparts on the other side. The salmon didn't turn these spruce into towering giants, but instead gave a boost to vegetation on the slower-growing side of the stream. Numerous factors such as soil chemistry, temperature and light all contribute to tree growth over many years. "This study demonstrates the importance of salmon carcasses for the growth of trees, yet within the context of an area where the trees are growing very slowly, and where climate and other factors also play a part in their growth," Quinn said. 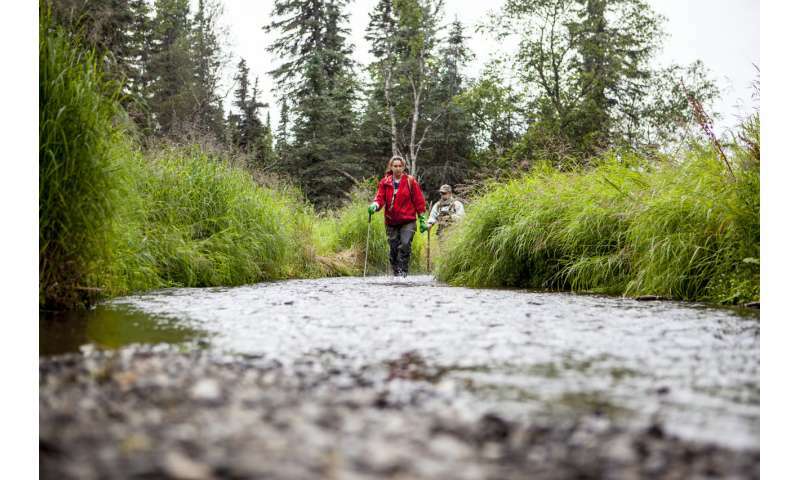 Over the 20-year study period, close to 200 undergraduate and graduate students, professors, staff and visiting scientists walked Hansen Creek, which drains into Lake Aleknagik, and other remote streams in the Bristol Bay region. They traveled in groups in case they came upon bears, which catch fish in the streams and often eat just part of the carcass. 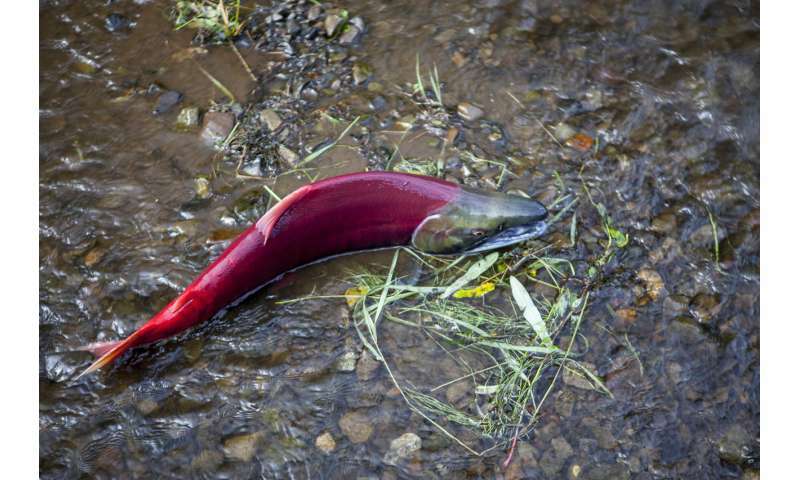 At the start of the spawning season in July, it is common to see up to several thousand sockeye swarming the mouth of the creek, their ruby-red bodies jostling in water less than 2 inches deep. "At some point they just go for it," Quinn said. "They are basically swimming over what's little more than wet rocks, powering through the mouth of the stream and up the creek." Data on sockeye numbers, behavior and predation by bears collected by Quinn and his colleagues for decades are unique—long-term datasets of this detail for sockeye salmon don't exist anywhere else. Many papers have resulted from these valuable data, Quinn said, and this new study is no exception. "This study contributes to our understanding of the role of salmon in the ecosystem, but it also illustrates the importance of patient, careful, long-term research, and the educational benefits that result from such research in a university," Quinn said.